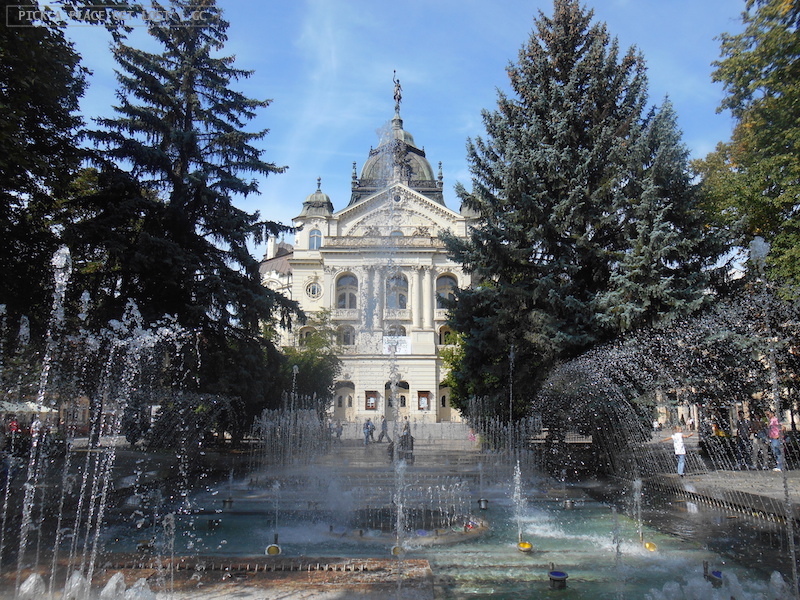 As I mentioned in my tenth (and last) Ukraine post, the final entry on our Ukraine agenda was Uzhhorod, a mid-sized city near the border with Slovakia. Uzhhorod is over 500 km from Brno, though, so we thought we would not go straight back to Brno from there, so as to make the inbound journey less exhausting. Plus, squeezing an extra stop along the way also meant getting to visit an extra city. Win win. 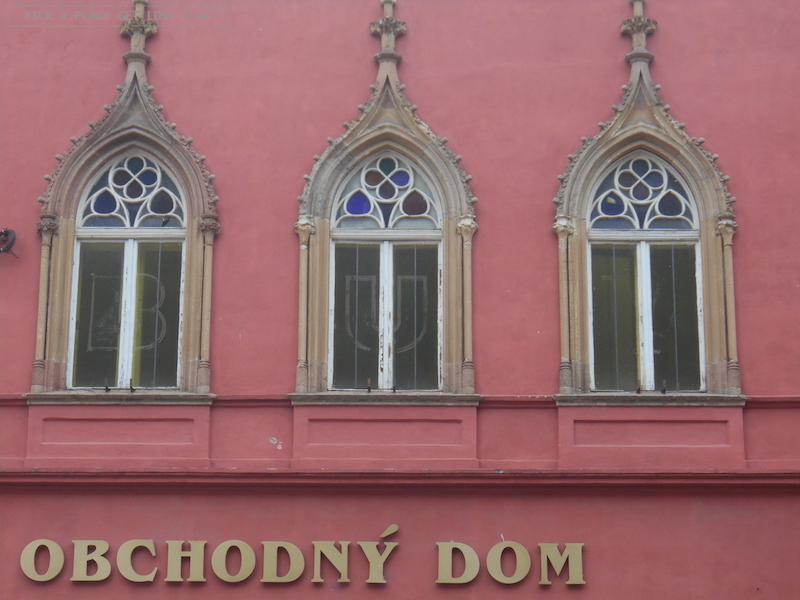 The Chosen One was Košice. 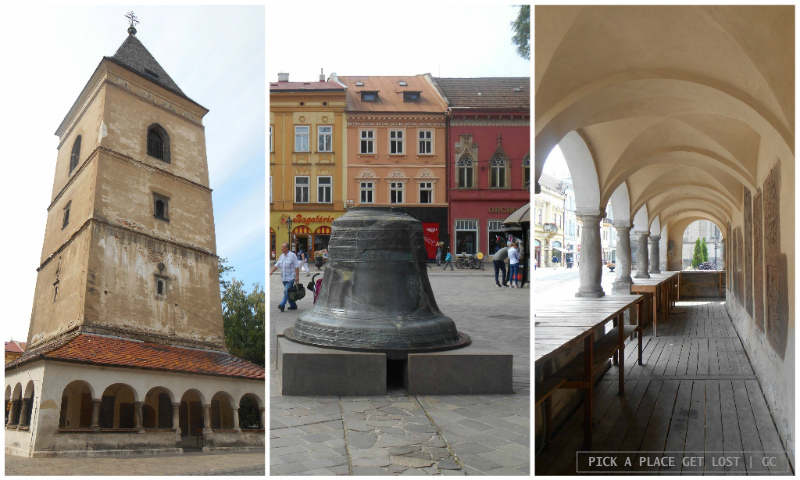 Being a reasonably large city and conveniently located in Eastern Slovakia, it offered promising sightseeing and handy transport connections. So, Košice. 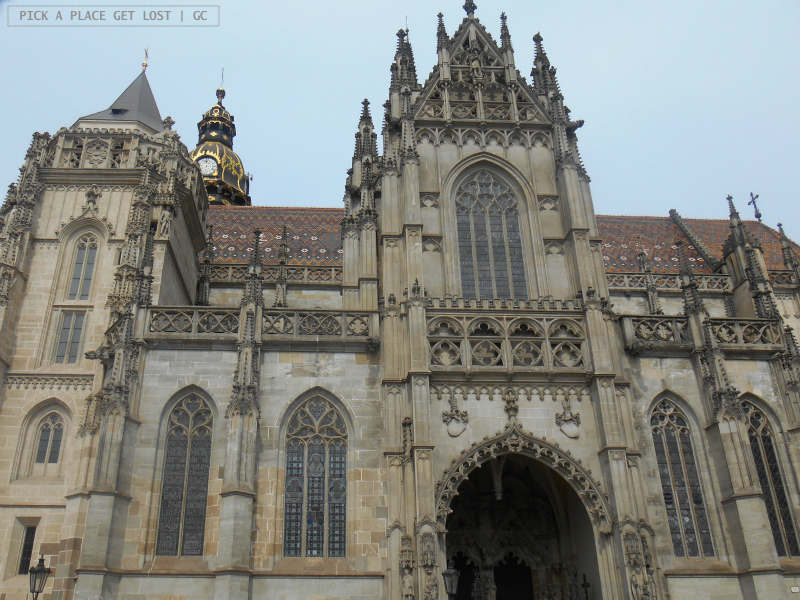 That Košice is the second largest city in Slovakia is about all I knew before visiting it. Till then, I’d only heard the name during Slovak classes at uni, either because some of the fake characters in the textbook were from there or because, being the name plural in Slovak, it made for a handy place name to practise place phrases. As it happens, though, my good friend and colleague Jakub is originally from Košice, which meant free tips and recommendations from a local! I did gain more than a good handful of them, in fact, so I take the liberty of sharing at least some here: I certainly owe it (at least partly) to them if we managed to see that much that well in the little time we could afford to spend in the city (i.e. less than a whole day). 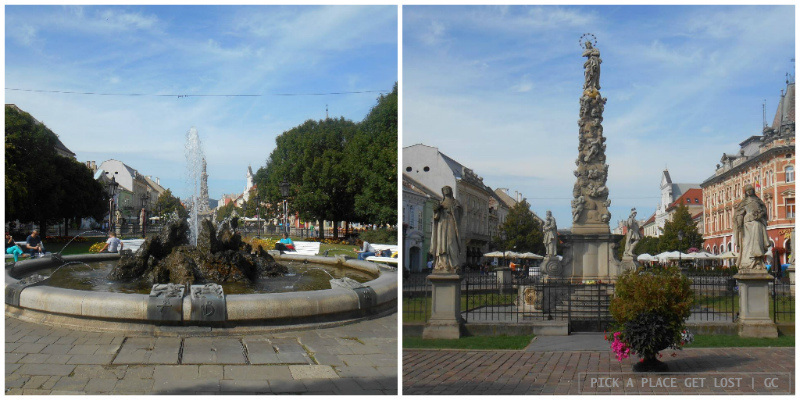 In Košice the train and the bus stations are adjacent to each other, so whichever transport you choose to get there, as you step foot on Košice soil you will be standing in Staničné námestie (Station square). Feel free to disregard the objective dreariness of the square, and head straight toward the city park (Mestský park), situated straight across the square from the railway station. 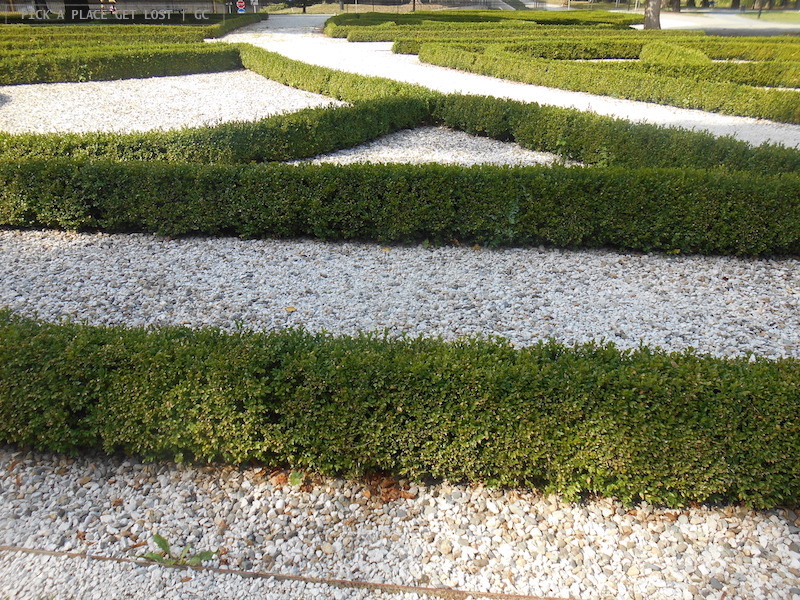 The city park is fairly standard in itself: no jaw-dropping garden views or picturesque ponds scattered with ducks. 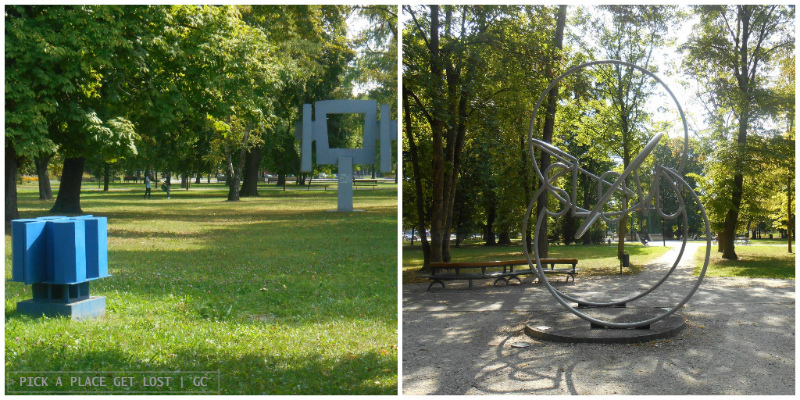 It’s mostly green meadows, trees, gravel footpaths, and the odd contemporary art installation here and there. 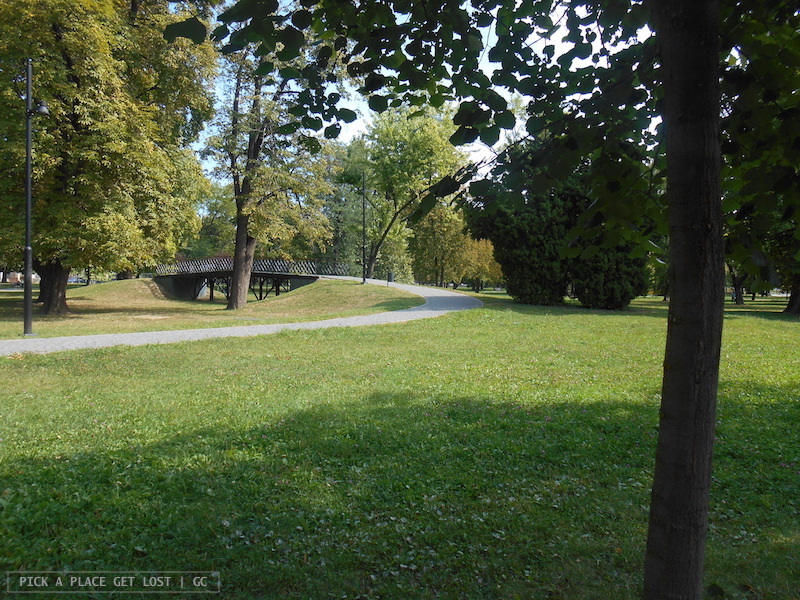 The park does make for a refreshing walk, though, while also getting you closer to the city centre. One of the park exits is marked by a small iron bridge. You want to cross the bridge and, while doing so, have a look at the road below. The road itself bears little to no significance at all, but you will notice that on the walls on both sides of the road blue lines have been drawn, vaguely similar to waves. Which they kind of are, as they mark the spot where the Mlýnský potok once flowed. A casual reminder of something that is no more. Just after the bridge, on your right you find Jakab’s Palace (Jakabov palác), probably one of Košice’s most remarkable buildings. 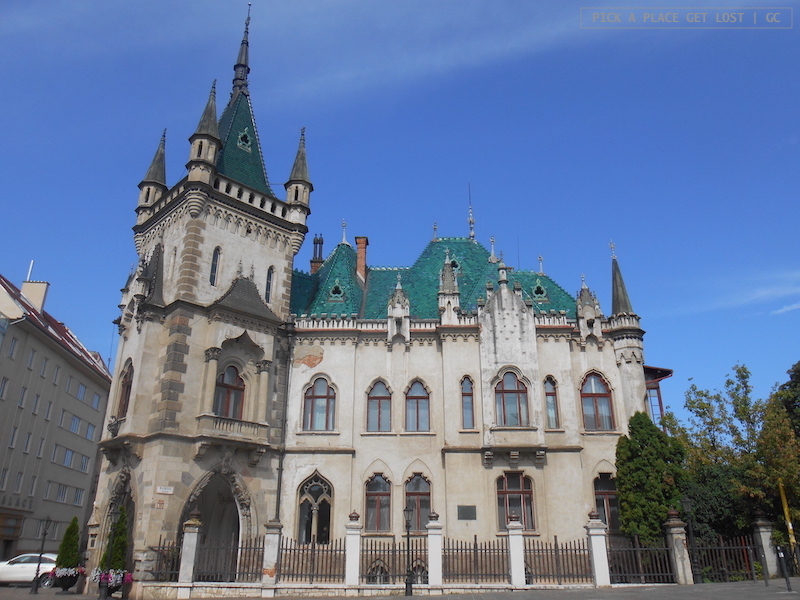 Built at the end of the 19th century and named after its author (Peter Jakab), the palace is currently closed to the public. In fact, it is in a rather poor state, which is a bit of a shame, if you think about its architectural value and the beauty of its exteriors. 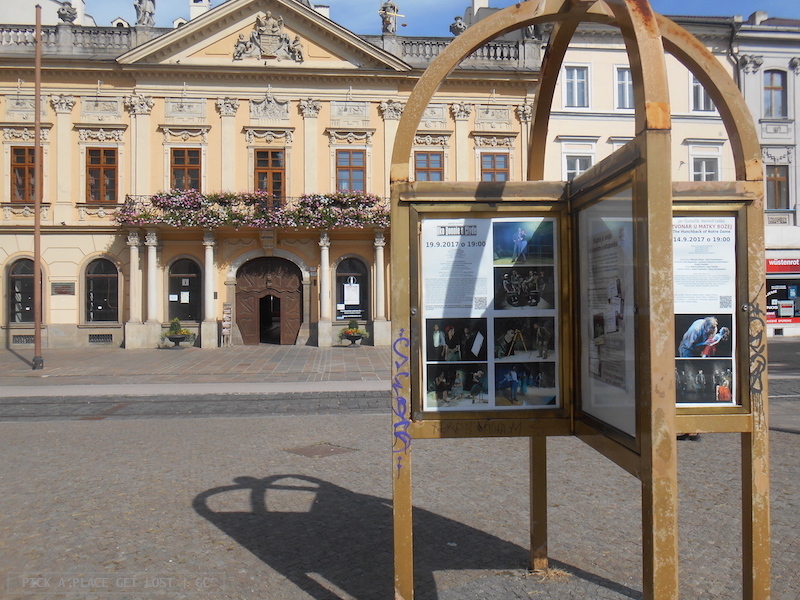 Jakab’s Palace marks the beginning of the historical centre. 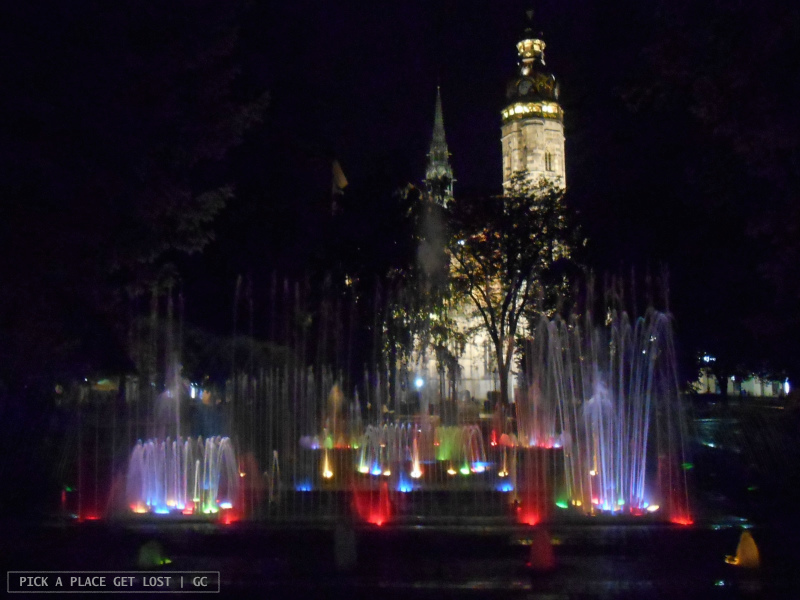 In fact, if you keep going straight down the street in front of you (which is called Mlynská), you will easily reach Hlavné square (Hlavné námestie), Košice’s main square. 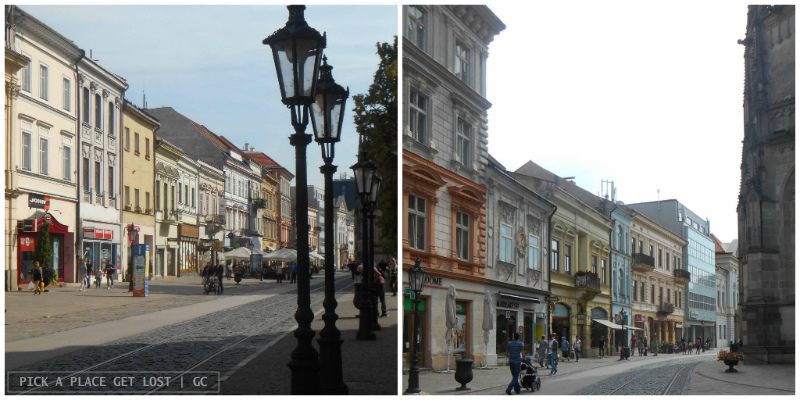 As for the street that cuts through Mlynská by the square, that’s Košice’s high street, Hlavná ulica. 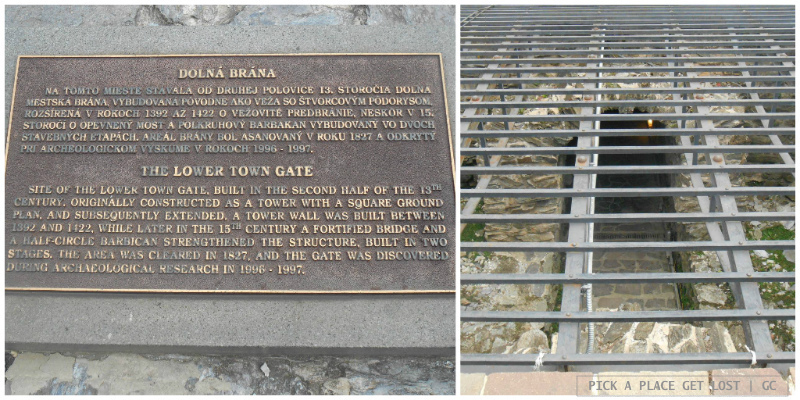 The city’s Lower Gate takes you down to underground Košice and around a portion of the city’s original fortification. 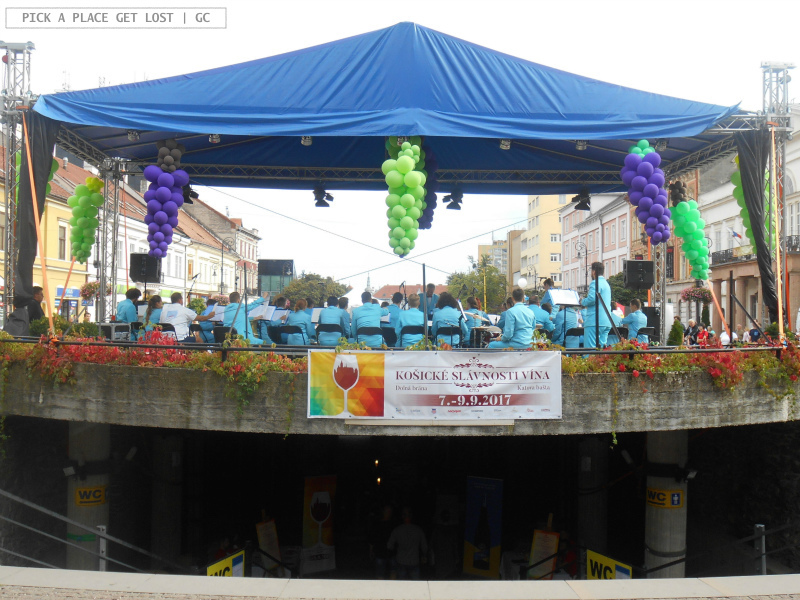 The complex, which dates back to the 13th century, is also home to the Košice Wine Festival, which takes place every year in September. In fact, Bobby and I happened to visit the city just when the festival was on, which explained the huge crowd of people happily strolling around the centre and contentedly sipping wine down by the gate. There was also a band playing both modern and traditional music on stage, which added to an already super lively atmosphere. The chapel was originally built as a cemetery chapel, and underwent a complex reconstruction between 1998 and the 2000s. 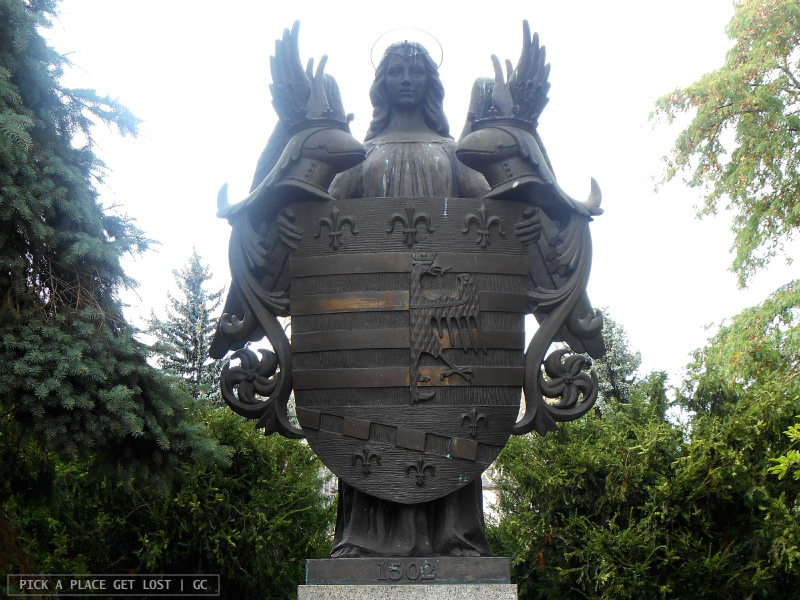 In the small park around the church do look out for the coat of arms of the city, aptly held by a bronze statue depicting an angel. It’s quite a significant monument, since Košice was among the first cities in Central Europe to be granted the status of city and its own coat of arms. Pretty cool. Well, this one you really cannot miss, as it’s the most imposing building in the square. 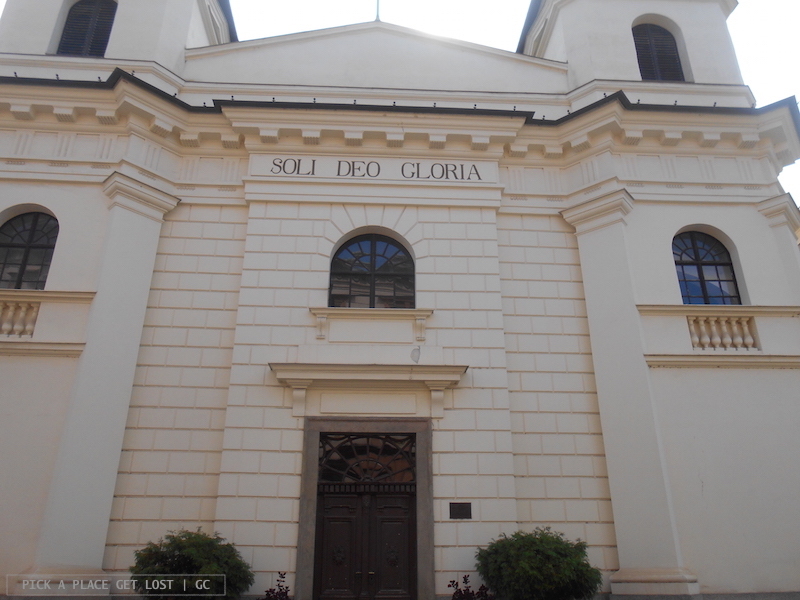 In fact, it appears to be the largest church in the whole of Slovakia. This huge Gothic church originally dates back to the 14th century, but was renovated several times over the course of many centuries. You can also climb to the very top of the main tower (Severná veža, literally ‘northern tower’). The view from up there makes up for all the steps you have to climb. We actually did not make it up there, but if you choose to give it a try, feel free to let me know whether it was worth the ascent! Though considerably smaller than the other, this tower takes up a spot that makes it stand out in the square. If you ask me, I will tell you that that’s also due to the architecture itself, which makes it one of my favourite elements in the whole square. The shape is a bit funny, as it resembles a giant pencil, but the portico that runs all around its perimeter softens the naked geometry of the building like lace decorations around an iron block. While the portico is a much later addition from the early 1900s, the tower itself dates back to the 14th century. It went from serving as guard tower (back in the old days) to being home to the wax museum (today). 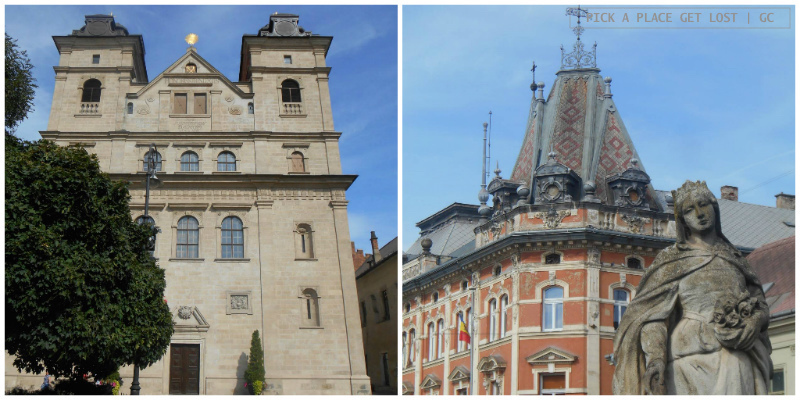 We did not get round to visiting the museum, so I really don’t know much about the collection, but the two Tourist Offices strategically opened around the square will give you extra recommendations on that. As for the bell ‘parked’ in front of the tower, it was part of its original structure, and only removed at a later stage, when the tower was partially damaged by a fire. 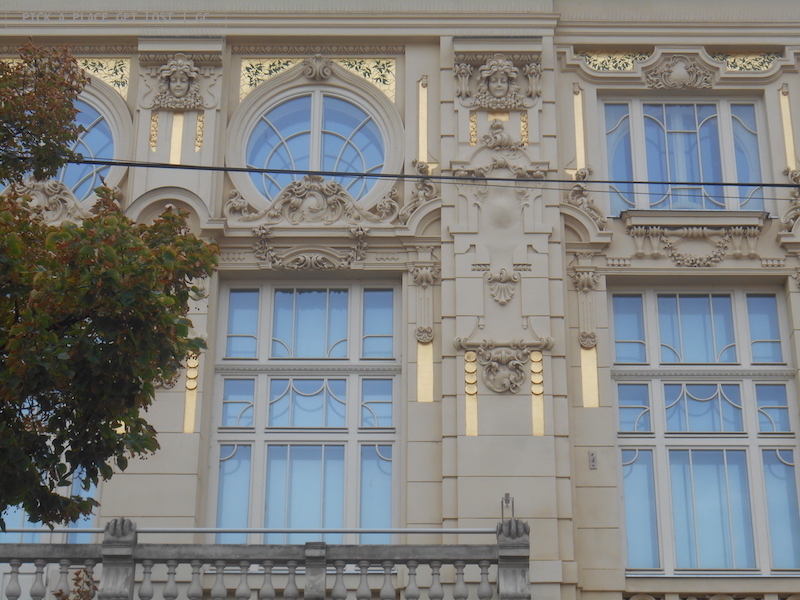 The National Theatre, clearly, is Košice’s main theatre, and its imposing Neo-Baroque facade with Art Nouveau additions can hardly go unnoticed. Chances are, though, that as you look at the facade your eye (and ear) will be quickly drawn toward the ‘attraction’ sitting right in front of the theatre itself: the Singing Fountain, possibly one of the most popular monuments in the square. Every now and then during the day the speakers distributed in the tiny park around the fountain play music – any type of music, from classical pieces to pop songs. As the music plays, the fountain ‘dances’ along, its spouts changing height to the sound of music. The fountain looks majestic in the daylight, also because its dancing jets look very nice against the Baroque outline of the theatre. It’s at night, though, that the fountain really looks unique. Ever-changing multicolour lights make it glimmer in the dark, so if you’re in the centre you should definitely head there again. You don’t want to miss it. Unlike the fountain, what does play regularly 24/7 is Zvonkohra, an installation of bells also situated by the National Theatre. Every hour on the hour carillon-like music rings out from the structure, also mingling with the music from the speakers and the fountain dancing spouts. Fun fact no. 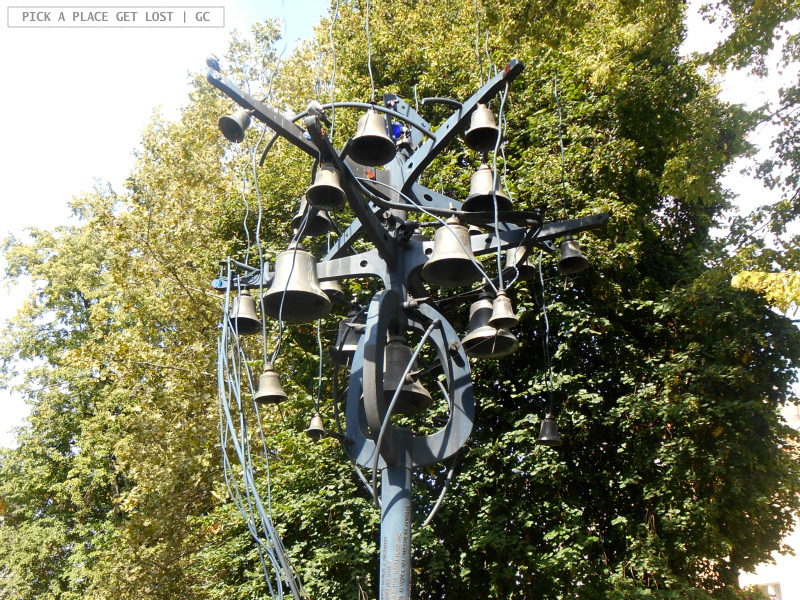 1: the installation consists of 22 bells, one for each Košice borough. Fun fact no. 2: Zvonkohra plays a ‘collection’ of around 100 different melodies. As the name suggests, this is the column that commemorates the victims of the plague. 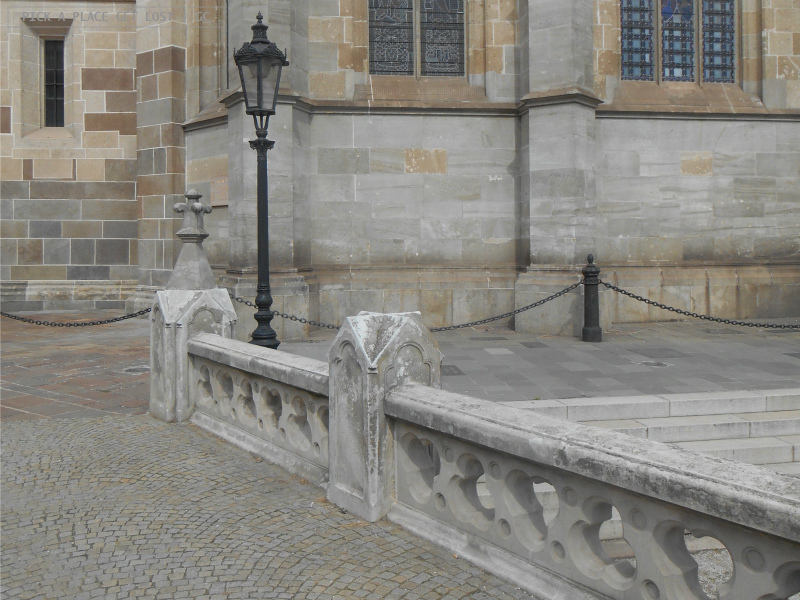 In fact, you can find plague columns in a lot of cities in the Czech Republic, Slovakia, Austria and elsewhere: Brno, Olomouc, Znojmo, Bratislava and Vienna are only a few examples. 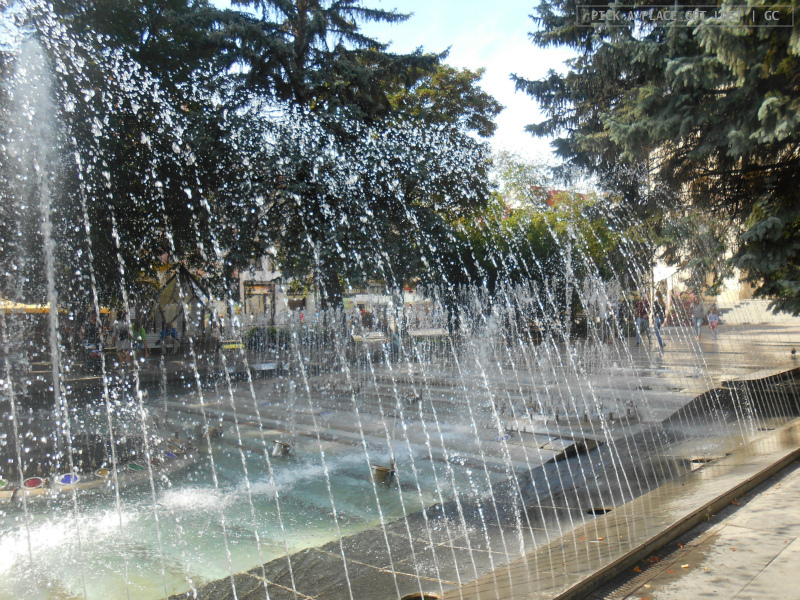 This one you find in the small park right behind the National Theatre, where another, more ‘conventional’ fountain is also situated. Hlavná is Košice’s high street. It’s a pedestrian promenade lined up by quaint, hipster-ish and/or traditional restaurants and cafes, as well as a number of elegant historical buildings. As you walk past the main square down the street, you will also notice a kind of narrow stream flowing in the middle of the street. 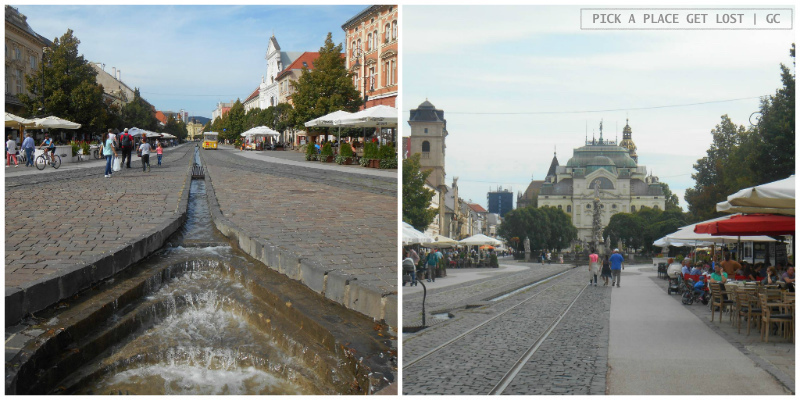 If you don’t see it, it can be because you’re visiting Košice in the cold season, and the ‘tap’ is usually closed some time in autumn and then reopened when the weather warms up again. Yes, the stream is an artificial one. It cuts the street in half, and it’s a ‘remainder’ of the actual stream that used to flow just there in the old days, which stream was part of the Mlýnsky potok (remember the fake waves painted on the side walls of the large road? That too was Mlýnsky potok). Another reminder of something gone but whose memory is preserved. Brilliant idea, if you ask me. 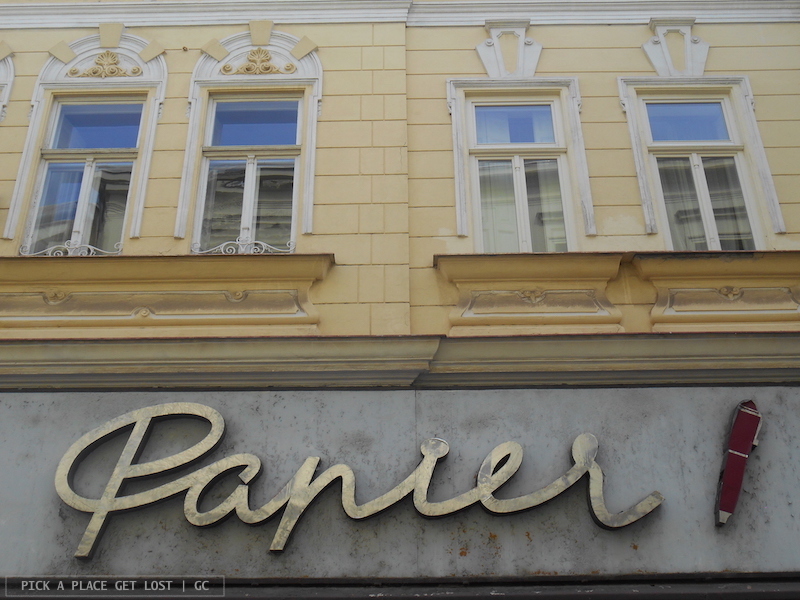 No major points of interest mark the two ends of Hlavná Street. 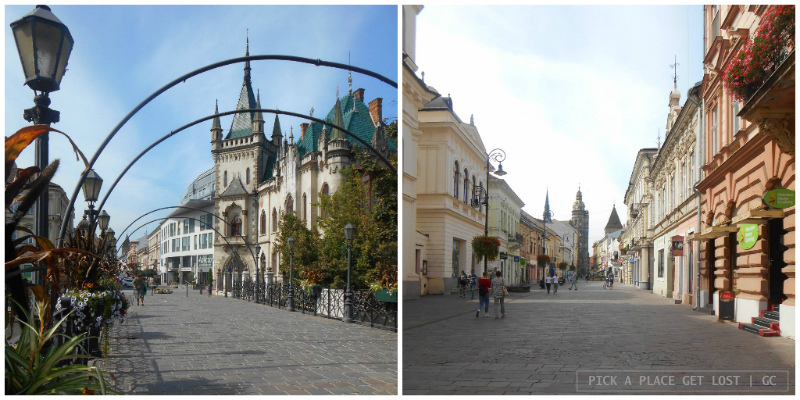 At one end, in Peace Marathon Square (Námestie Maratónu mieru), you will find the Eastern Slovakia Museum (Východoslovenské múzeum). 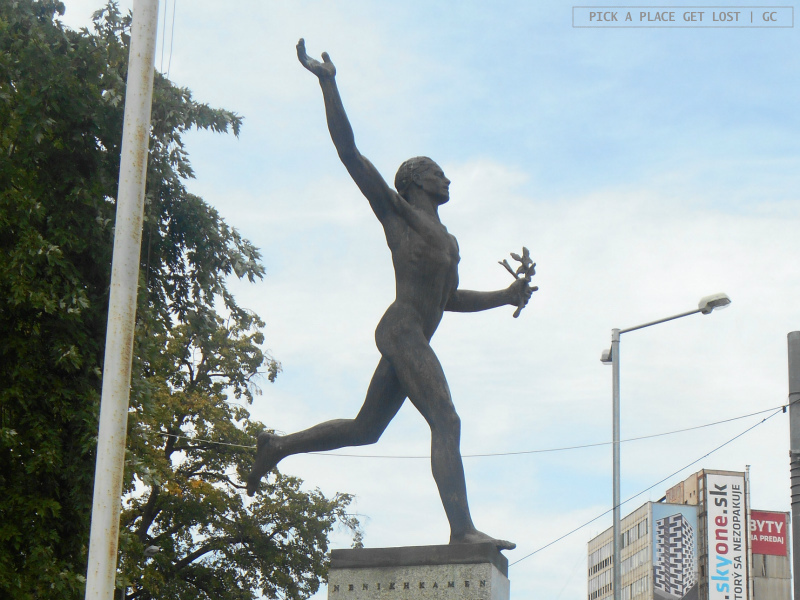 At the opposite end, in Liberators’ Square (Námestie Osloboditeľov), is the Monument to the ‘Illustrious Soldiers of the Red Army’, erected around 1945 to commemorate the Soviet soldiers that liberated the city (and the country) from the German invaders. 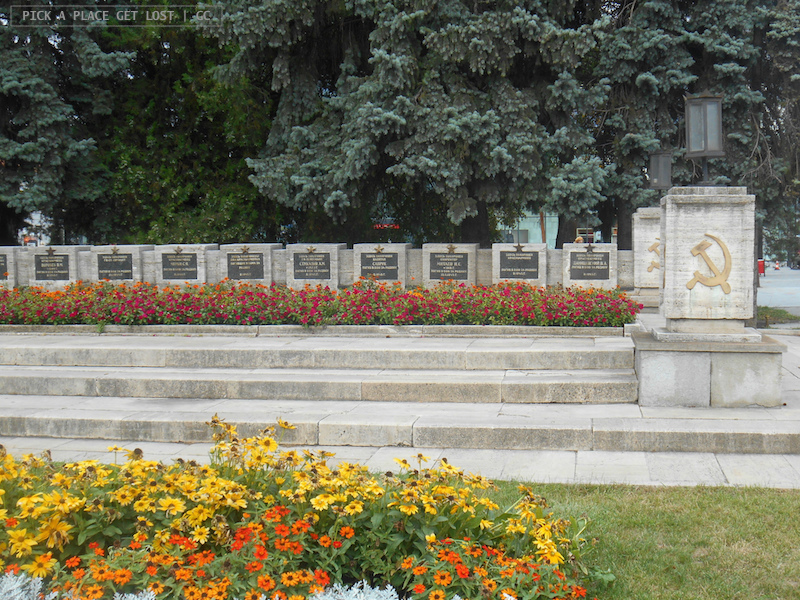 The monument consists of two taller columns and a series of lower podiums, all of which are ‘labelled’ with the Soviet hammer-and-sickle symbol. The fact that some of the Soviet ‘logos’ have been hammered off the monument testifies to its rather controversial nature, which, decades later, still lingers in the air, at least to a certain extent. Well, there’s certainly Hrnčiarska Street. It’s known as Ulička remešiel, literally ‘Crafts Lane’, because it’s full of traditional shops of potters, bakers, carpenters, metalworkers, herbal specialists, and so on. Again, a picturesque ‘throwback’ to the old days. I understand this is the third time that I’ve made a similar remark in this post, but really, the way Košice preserves the memory of some things from its past is quite striking indeed. Crafts Lane is right behind the main square. 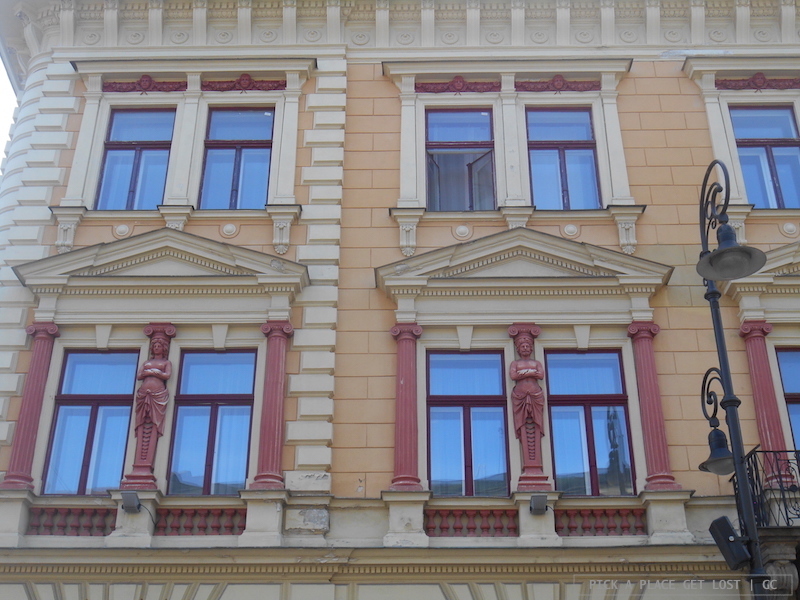 If you’re walking down Mlynská toward Hlavné square, once you’ve passed Jakab’s palace Hrnčiarska is the first on your right. This one is a bit off the beaten path. 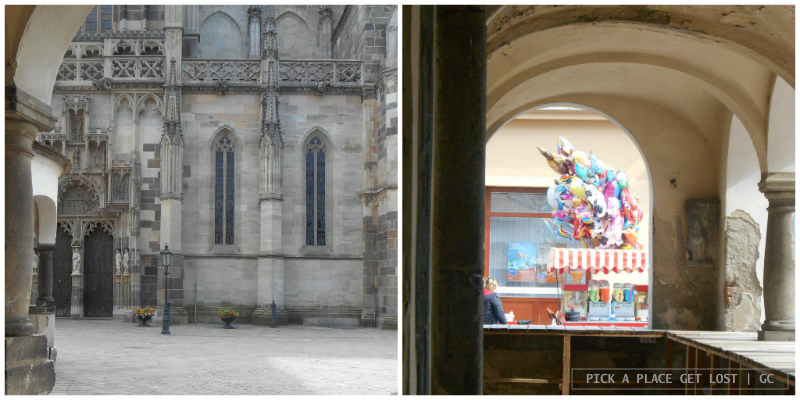 Because we had very little time to explore the city, we also had to keep it off our Košice route, but for my next visit it will definitely be no. 1 on my to-do list. The watchtower sits at the northern end of the city on Hradová Hill (Castle Hill). It was built in 1986 to provide the climber of the 99 steps to the top with a memorable view of Košice and the forests surrounding the city. Plus, on the way to the tower you will also walk past the ruins of the old castle. 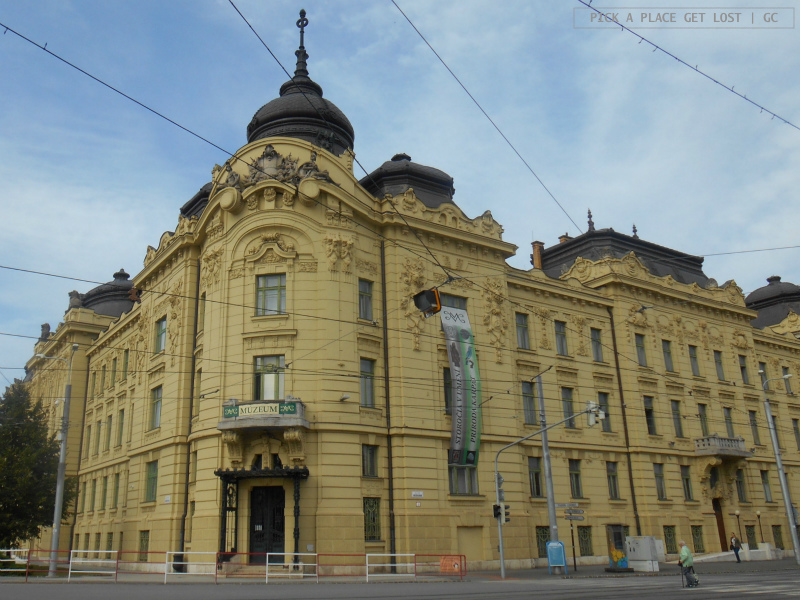 To get there take bus 29 toward the zoo and get off at Vyhliadková veža stop (it should take around 15-20 minutes from the city centre). Then head uphill toward the tower. Though the tour itself has come to an end, I’m not quite done with Košice. Yes, because if you do make it to the tower, by the time you return to the city centre you will be either ravenous or desperate for a drink (hot or cold, depending on the season) – or both. So I thought that a couple of food-related recommendations would make for a welcome addition to all the previous sightseeing talk. 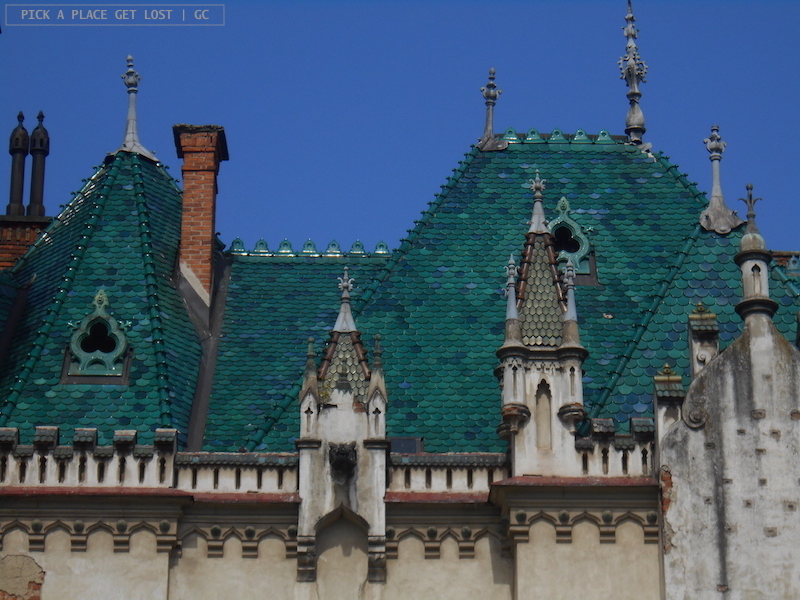 Just keep an eye out for the next Košice post! 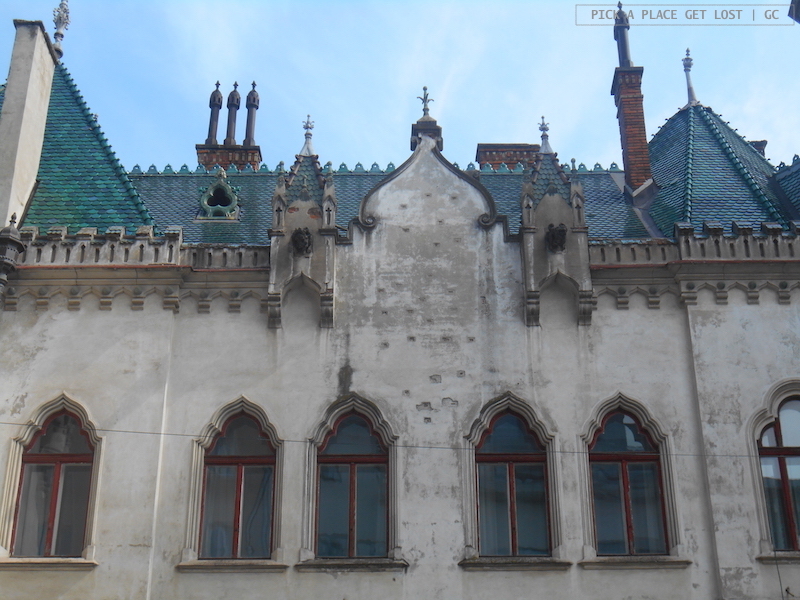 This entry was posted in Košice, Slovakia and tagged eastern slovakia, kosice, sightseeing, sightseeing kosice, slovacchia orientale, slovakia by Giorgia. Bookmark the permalink.